Kesari Movie Review: A Hard Hitting Tale Of Courage, Valor And Bravery With Akshay Kumar Stealing The Show With His Fiery Act! Depicting the inspiring tale of the Battle Of Saragarhi is not a mammoth task but filmmaker Anurag Singh has managed to bring out this story convincingly on celluloid. The filmmaker has truly given justice to this recreation of the iconic heroic acts of the 21 Sikh soldiers. 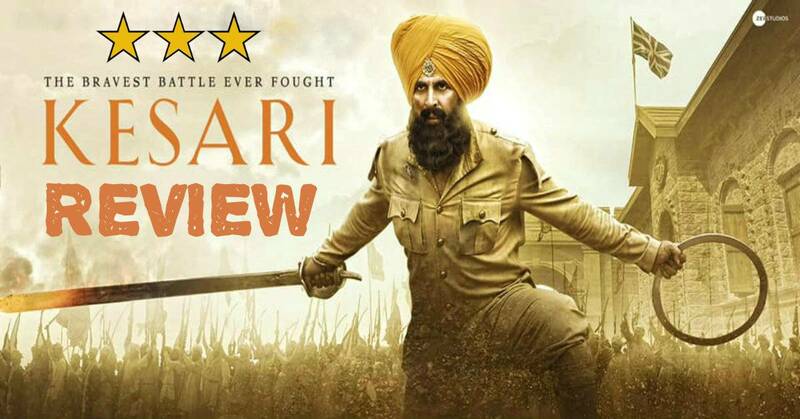 It is needless to say that Akshay Kumar steals the show with his riveting and powerful act as Havildar Ishar Singh. However, the film falls flat in some dimensions on the first half because of the lousy screenplay but the main action emerges and encapsulates you on the second half. The film delivers its message of an undying sense of patriotism and sacrifice in a convincing manner. The aftermath and atrocities of war is showcased in a compelling manner. The first half is spent on shaping up the characterization and the camaraderie of the battalion which is endearing but is also rigid at the same time. The film wins big in the choreography of the war sequences and the production design by Amit Ray and Subrata Chakraborty with the top notch cinematography by Anshul Chobey. There is a scene wherein a Sikh soldier comes out with his whole body on fire but refusing to cry out in pain sending the enemy into utter disbelief and in the other scene, a soldier fights till the last breath on his body until he is stabbed brutally by the Afghans. There are scenes like these which create an impact on the compelling second half on the onset of the battle. The symbolization of the color 'kesari' which signifies bravery was shown in an impressive manner. If not for the too tedious first half which was only spent in some umwanted character building, the film would have truly roared higher. Another disappointment was Parineeti Chopra who played Akshay's love interest and was just reduced to a mere prop who only appeared in some glimpses in his dream sequences. The writing of Anurag Singh and Girish Kohli looked well researched. The dialogues have a depth and establish a fine interplay between the characters. The film has several religious references which preach humanity instead of war. Along with aftermath of Jihad, the pain of slavery under the British rule is also showcased. There are some amiable moments to depict the brotherhood of the 21 Sikh soldiers. Talking about the performances, it is Akshay Kumar who is the main holding anchor of the film. He roars loud like a fierce lion as Habildar Ishar Singh. It is true that Akshay has looked more powerful in other films and he struggles on the physical aspect of the character but his performance is truly top notch. His character depicts the spirit of Sikh valor and values effectively. Akshay does full justice to the character. Parineeti Chopra was just reduced to a wasted cameo and her chemistry with Akshay did not unfold efficiency. The main amtagonist as the Afghan leader was powerfully portrayed by Rakesh Chaturvedi Om. Kesari is the story of true valor, bravery, courage and sacrifice. But it deserves to be watched as a tribute to the 21 Sikh bravehearts who fought valiantly even though they were heavily outnumbered by 10000 Afghans.